One of my more popular projects this year was Creating Loom Art in Tableau. I wasn’t sure how people would react to it, but was pleased with its reception. After posting it, Josh Tapley mentioned that it reminded him of a tool he encountered called Geometrize when attempting to recreate Andy Cotgreave’s Kraken Art (if you haven’t read Andy’s post on this, then you definitely need to check it out—it’s brilliant!). 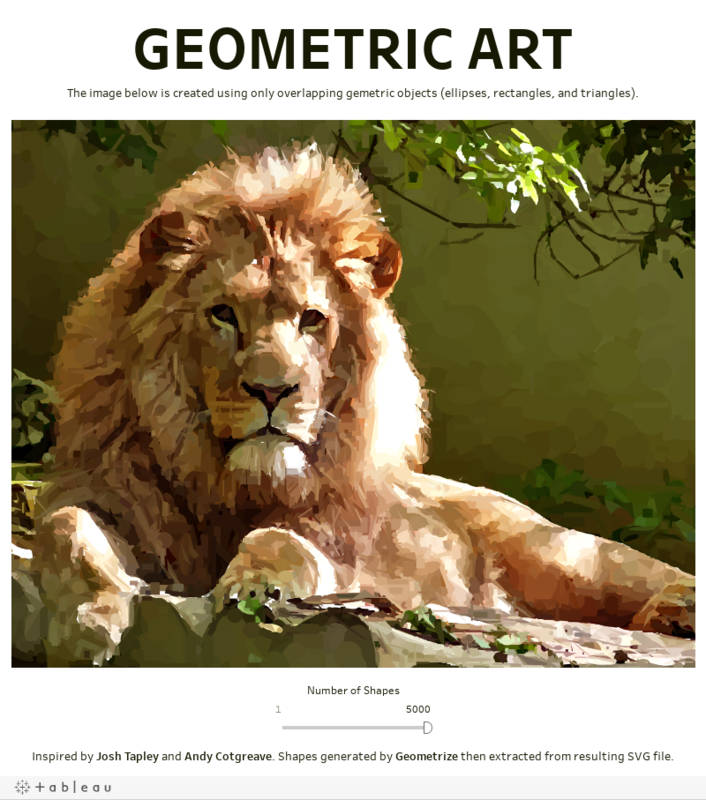 Geometrize is an open-source tool, written by Sam Twidale, which converts any image into “geometric primitives” (rectangles, triangles, and ellipses). The tool allows you to upload your own image, specify what types of shapes you’d like to use and how many shapes should be rendered. Once the image has been created, you can download it as a PNG or SVG file. After playing with the tool a bit, I was completely fascinated by it. It’s really quite amazing. And, of course, I decided that I had to find a way to visualize the resulting images in Tableau. 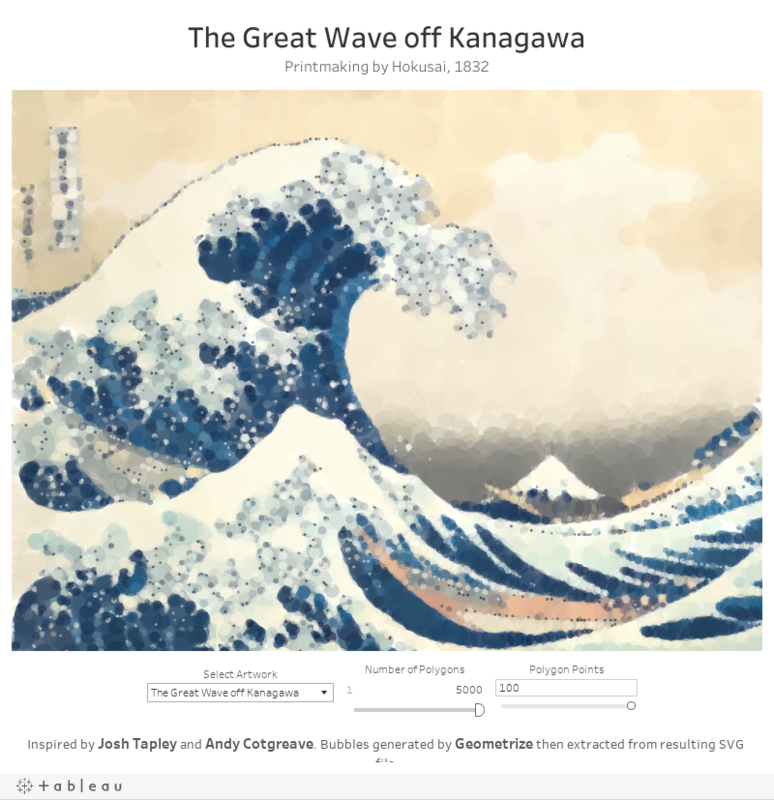 So, in this post, I’m going to share the journey that I took to create these in Tableau and, at the end, I’ll give you a tutorial on how to create them yourself. 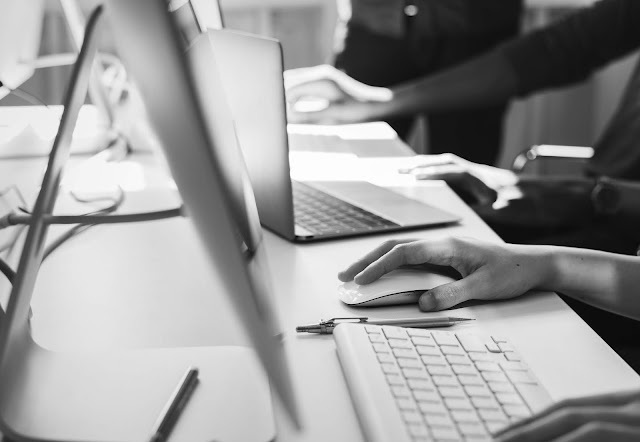 Before we jump into this, it’s important to talk a little about Scalable Vector Graphics (SVG) files as these will be critical to getting these images into Tableau. SVG files are basically XML-based files which define an image. An SVG file defines a variety of shapes that are used to build an image—basic shapes, lines, polygons, etc.—as well as coloring, shading, and a lots of other components of images. Because they are XML, SVG files are text-based and, for the most part, readable by humans. So, in order to extract the “geometric primitives” from the images we’ve created, the first step will be to export our rendered image into SVG format, which we’ll then break into its component shapes. cx – x coordinate of the circle’s center. cy – y coordinate of the circle’s center. fill – Fill color in RGB. fill-opacity – Opacity/transparency of the fill color (this can actually be adjusted in the tool’s settings, but will remain consistent throughout all objects in the file). With a little bit of Excel work, I was able to parse out the RGB values, then convert them to Hex using the same VBA code I used in my post on Recreating The Scream in Tableau. Note: In the “How To” section, I’ve included a link to a spreadsheet template which contains the parsing formulas and the RGB to Hex VBA code. But, I quickly found a couple of problems with this approach. First, I had to manually adjust the overall Size of the bubbles to make sure they were just right. Second, because there is a maximum shape size in Tableau, the final images were all quite small even at the maximum size. In order to address these problems, I decided that I’d need to draw each circle in a more precise fashion. Enter parametric equations. In my recent post on creating curves in Tableau using parametric equations, I explained how to use these equations to create a circle. So, I applied that same concept in order to draw individual circles, coloring them the same way as in my first attempt. Each circle is actually a polygon with 100 different points. Typically, I’d use more points for a circle in order to prevent them from looking blocky, but most of the circles are relatively small, so I was able to get away with only 100. And, by keeping this number small, the image renders much more quickly. I personally like watching these “build” from a blank palette, so here’s an animated gif of a different artwork. See how long it takes you to recognize it. Now, having conquered the bubbles, I felt I was finally ready to create images using all the shapes allowed by Geometrize. These include rectangles, rotated rectangles, triangles, ellipses, rotated ellipses, and circles (Note: Geometrize actually includes lines as well, but I have decided to exclude those and focus only on actual shapes). The problem, however, is that the structure of the SVG elements are quite different for each of these different object types. For example, a regular rectangle is created in SVG using a “rect” object, which includes the coordinates of the top left point, plus height, and width. But a rotated rectangle is generated using a “polygon points” object which lists the coordinates of all four points of the rectangle. This being the case, I wasn’t going to be able to use Excel formulas and macros to extract the data. So, I decided that I’d need to write a bit of code. The good news is that I have a background in programming. The bad news is that it’s been a long time since I’ve written code on a regular basis and much of my work experience has been with fourth-generation languages built into ERP systems. But, based on some conversations with Brit Cava and Rody Zakovich, I had been intending to learn Python, so what better way to learn than to jump right in!! The basic idea would be to read each object from the SVG, then create polygons for each of them, writing these polygons to a csv file. If you’re interested, here’s some high-level pseudocode. 1) Open the SVG file. 2) Parse out each object. 3) For each object, parse out each of its components. Rectangles – Write each of the four points to the polygon csv file. Polygon Points (Rotated Rectangles and Triangles) – Write each polygon point to the polygon csv file. 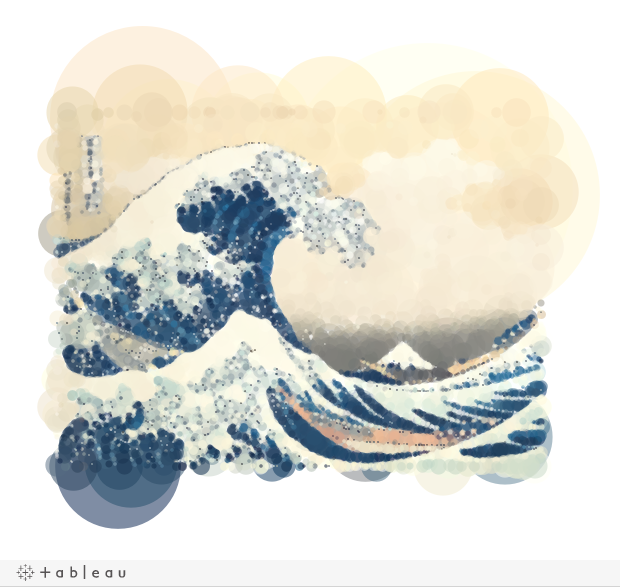 Ellipses (Including Rotated Ellipses and Circles) – Use parametric equations to create 100 point ellipses and write those points to the polygon csv file (Again, if you’re not familiar with parametric equations, check out my recent post on using them in Tableau). 5) Along the way, for each shape, translate the fill color from RGB to Hex and write the color to a separate csv. After picking away at it for a few days, I was able to create a program to do exactly this. Not bad for my first Python program!!! I’m not going to go into any more detail about the code itself, but if you’re curious, you can find it on my GitHub repository. And, again, I really love seeing these built from a blank screen, so here’s an animated gif. So, how did I do this? Well, check out the following How To section for step-by-step instructions. 2) Click the Settings option in the middle of the screen. 3) Select the shapes you’d like to include. If using methods 1 or 2, then only select circles. If using method 3, you can select any combination of shapes you like, except lines. 4) Below the list of shapes, set the Max Shapes Cap. The default is 7,000 but everything I’ve created, including templates I’ll be providing here, used a maximum of 5,000. 5) Scroll down and select the Open Image option then select the image you’d like to process. 6) If it does not start generating shapes, then click Run. 7) The process will take a few minutes to complete. Once it’s finished, click Save SVG to download the SVG file. 2) Where it says Option 1 – Choose a XML File, click Choose File, then select your SVG. 3) Scroll down to Step 3: Generate Output and select XML to Excel. And Excel file will be downloaded. 4) Open the Excel file and paste it into columns B – F in the Excel template, Template.xlsm. 5) Use the values in column N to generate a custom categorical color palette in Tableau (for more details on this, see Create Custom Color Palettes on the Tableau Online Help site). The template is a macro-enabled spreadsheet, so you’ll need to enable macros when you open it. It is configured for 5,000 points, so if you’ve created an SVG with more than 5,000, you may need to copy some formulas, etc. to additional rows. The template has two sheets, Shape and Range. For method 1, you’ll only need Shape. Method 2 will leverage bins and will, therefore, require the Range sheet. 1) Generate your Excel file and create your custom color palette using the steps detailed above, then connect to the file in Tableau. 2) Drag the Shapes sheet to the data pane. 3) Convert Circle # to a dimension. 4) Drag Circle # to the Color card, then choose your new custom color palette. 5) Change the color transparency to 50%. 6) Change the sorting of Circle # to descending (These images are created by layering shapes on top of each other, so the descending sort will ensure the proper layering). 7) Create a calculated field called Circle Area with the formula “PI()*SQUARE([_R])”. 8) Drag Circle Area to the Size card. 9) Drag _Cx to the Rows shelf and ­_Cy to the Columns shelf. 10) Reverse the y axis. 11) Change the shape to a filled circle. 12) Play with the sizing of your shapes until the image looks right. 13) Make other adjustments as desired including gridlines, fixed axes, etc. 1) Generate your Excel file and create your custom color palette using the steps detailed above. 2) You have two options at this point. You can simply download my template workbook (Bubble Art Template) and connect it to your Excel file. Or you can move on with the following steps to build it yourself. 3) Connect to the Excel file then drag both Shapes and Range to the data pane. Join them using a join calculation where 1=1. 4) Create bins for the Range field with a bin size of 1. 5) Download the template workbook provided above and copy the following calculated fields to you workbook: Index, T, X, Y. I’m not going to go into the calcs here, but feel free to dig into them if you like. 6) Drag Range (bin) to the Detail card. 7) Convert Circle # to a dimension. 8) Drag Circle # to the Color card, then choose your new custom color palette. 9) Change the color transparency to 50%. 10) Change the sorting of Circle # to descending. 11) Drag X to the Rows shelf and ­Y to the Columns shelf. These will become table calcs. Change them to compute using Range (bin). 12) Reverse the y axis. 13) Change the chart to Polygon. 14) Drag T to the Path card. 15) Make other adjustments as desired including gridlines, fixed axes, etc. 1) If you’re familiar with Python, you can download the code for Parse SVG.py. 2) If not, you can download the executable package, ParseSVGPackage.zip. Extract all the files to your computer, then run Parse SVG.exe. Sorry Mac users, but I think this will only work for Windows, but if you really want to try this, I’m happy to help you get Python set up on your machine. 3) The program will guide you through the process of selecting a source SVG and will then output two csv files, one with color information and another with polygons. 4) Based on the color csv, create your custom color palette. 5) Connect to the polygon csv in Tableau. 6) Drag X to the Rows shelf and ­Y to the Columns shelf. 7) Reverse the y axis. 8) Drag Polygon ID to the Color card, then choose your new custom color palette. 10) Change the sorting of Polygon ID to descending. 11) Change the chart to Polygon. 12) Drag Point ID to the Path card. So there you go. If you create any geometric art using this method, please share with me. I’d love to see what you create!! Mind blowing !!!!!!........ Truly Inspirational !!!!! Thanks for the insightful tutorials on Tableau! I am amazed at what you are able to do, and hope that one day I will get "your autograph". is it safe to assume that translate are the cordinates x,y and scaling is some kind of representation of the radius? I haven't seen the tool create those SVG objects. Which shape types did you choose? This is really awesome!!! My wife and I are both big Tableau nerds, so i re-created one of our wedding photos as part of her anniversary present. In the desktop version I have it set up with page controls so you can see the image being built. Thank you for this!! Great! I'm glad you like it. I used pages to build the gif. I just set up the page control then used a free software product called ScreenToGif to capture the animation and save it off as a gif. And the photo looks great!